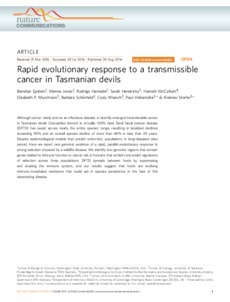 Although cancer rarely acts as an infectious disease, a recently emerged transmissible cancer in Tasmanian devils (Sarcophilus harrisii) is virtually 100% fatal. Devil facial tumour disease (DFTD) has swept across nearly the entire species' range, resulting in localized declines exceeding 90% and an overall species decline of more than 80% in less than 20 years. Despite epidemiological models that predict extinction, populations in long-diseased sites persist. Here we report rare genomic evidence of a rapid, parallel evolutionary response to strong selection imposed by a wildlife disease. We identify two genomic regions that contain genes related to immune function or cancer risk in humans that exhibit concordant signatures of selection across three populations. DFTD spreads between hosts by suppressing and evading the immune system, and our results suggest that hosts are evolving immune-modulated resistance that could aid in species persistence in the face of this devastating disease.